This article originally appeared on the PlutoPress blog and is authored by Amazon workers and their supporters. Global capitalism is a precarious system, relying on the steady flow of goods across the world. When Amazon arrived in Poland, it was attracted by cheap labour costs and strict union laws, little did it know that the high-pressure working conditions it institutes would produce wildcat strikes and cross-border solidarities amongst its Polish workforce. In this blog, Amazon warehouse workers provide a first-hand account of their work and their struggles. This blog is extracted from Choke Points, a collection edited by Jake Alimahomed-Wilson and Immanuel Ness that tells the stories of the workers who undermine capitalism at its weakest point, from South China dockworkers, to the Southern California logistics sector. In 2014, Amazon set up its first warehouses in Poland, one close to Poznań and two close to Wroclaw. Two more will open in the fall of 2017 near Szczecin and in Sosnowiec (close to Katowice), and there are rumours that one more is planned for 2018 close to Łódź. Amazon’s Polish warehouses service customers in neighbouring Germany, not in Poland. What make Eastern European countries like Poland attractive for logistics and industrial capital are not the local consumers but labour costs that are significantly lower than in Western Europe, capital-friendly labour laws, cheap land, and tax bonuses offered by the state. Eastern European regions adjacent to Germany and Austria especially are well connected to Western European consumer markets, with a growing network of airports and motorways. So, it is not surprising that Amazon did not just choose Poland to expand its distribution network, but has also invested in the Czech Republic and will open a facility in Slovakia soon. In the cities close to the existing warehouses, Poznań and Wrocław, the unemployment rate is low, and regarding terms of employment, wages, and promotion opportunities, working at Amazon is not particularly attractive—especially for urban workers with other job opportunities. As a result, Amazon has to rely on hiring a large part of its labour force from villages within a 120 kilometre radius around its warehouses, and organising their transport with buses. For the workers this means long hours of commuting: most spend more than 12 hours—some up to 17 hours—per day away from home. Amazon allows workers to log into a system that monitors each worker’s performance, and the data is used to set their obligatory work rates, such as the demanded number of products scanned per hour. As long as they do not do anything that can be registered in the system (like ‘scanning goods’) the system records ‘time off task.’ That means that even if they work—doing something that is not registered—this time is recorded as taking a break. Such periods are added up and calculated as illegitimate ‘extra breaks.’ If workers do not meet the rates (that is, they work ‘too slowly’) or have too many ‘extra breaks,’ they get negative ‘feedback,’ and after several ‘feedbacks’ they can get a warning and eventually be sacked. Trying to reach the rates is stressful enough, but even worse are days when Amazon tries to set ‘records,’ like 1 million orders processed in one warehouse within 24 hours. Warehouses compete with each other, and Amazon uses those days to push workers to the limit, ordering obligatory overtime and cancelling breaks before midnight. If workers reach the demanded ‘record,’ managers get an extra bonus and workers get T-shirts. In late 2014, a few months after the warehouse opened, a group of Amazon workers in Poznań setup the Inicjatywa Pracownicza (ip, or Workers’ Initiative), a union without paid staff, based on self-organising and self-empowerment of workers. At the time, rank-and-file workers and team leaders were involved, but since then the union section has been primarily made up of rank-and-file workers. Currently it has a membership of about 400. Before a strike in Germany in June 2015, the management the Poznań warehouse announced one hour of overtime during the upcoming strike day across the border. Workers in Poznań were already aware that Amazon tried to bypass and undermine strikes in Germany by shifting orders between warehouses (in this case to Poland). Growing local tensions in the Poznań warehouse and the prospect of being used as scabs led to vivid discussions among workers on how to resist. Eventually, during the night shift on June 24–25, 2015, a few dozen workers improvised a slowdown in one department, taking advantage of a bottleneck in the processing of orders and disturbing operations in other parts of the warehouse. They showed a collective will to resist, their solidarity with workers on strike in Germany, and a keen knowledge of the work process and how to disrupt it. After the first slowdown in June 2015, ip started an official collective bargaining process demanding, besides other things, a wage increase to 16 zlotys (20 to 25 percent more) and a different calculation of breaks (as workers lost a lot of break time walking to the canteens). When negotiations and mandatory mediation ended without agreement, ip could not call for a strike although more than 97 percent of those participating in the strike ballot voted for strike. Polish labour law, one of the most restrictive in Europe, requires a ballot with a turnout of at least 50 percent of the entire workforce and a majority vote. At Amazon Poland, only 30 percent of the workforce participated in the ballot. Still, more than 2,000 workers—directly employed and contemporary agency workers—voted for strike, a clear sign of the discontent among Amazon’s workforce. The strike ballot was lost, but it made ip’s organising drive, the conflict about working conditions, and the resistance more visible to all Amazon workers in Poland. Amazon Poland raised the hourly wages again by 1 zloty (to 15 zlotys, plus an extra zloty for senior workers). Workers usually do not react with collectively organised protests, but with multiple (minor) acts of disobedience like starting breaks early, working slowly, rejecting tasks, using gaps in the system, challenging decisions of superiors, regularly visiting the toilet or otherwise leaving the workplace, and simulating accidents. 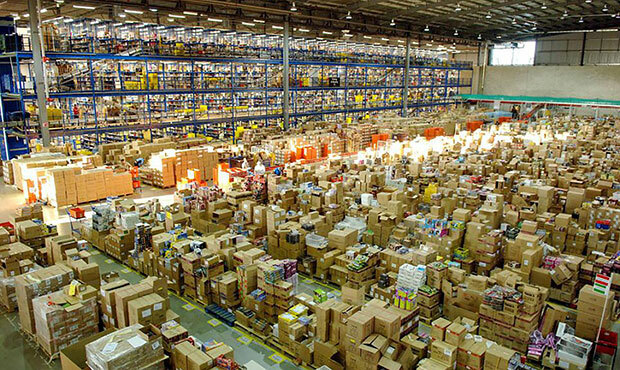 Amazon is unable to completely subordinate the workers’ activities to the rhythm of the warehouse machine. The organising drive has encountered a series of problems. Following the slowdown and the strike ballot, Amazon increased the pressure on activist workers. While initially, workers were allowed to speak during the pre-shift meetings and general assemblies called ‘all hands,’ this was limited after workers had used them to voice complains and demands. Amazon also tried to prevent regular leafleting outside the warehouses. It assigned ip activists to the most boring and tedious positions, and frequently transfers them so they do not form closer relations to colleagues. Amazon also tries to get rid of union activists and senior workers in general, and to replace them with temporary agency workers without experience (and without the opportunity to take sick leave). The high labour turnover at Amazon is because of not only temporary agency work but also the fact that often permanent workers quit the job because they are tired and fed up with the conditions. This represents a challenge for ip, too. Quitting can be seen as a sign of discontent and resistance, but also weakens the union as members leave and drop out of union activities. To keep its strength and numbers, the union constantly has to recruit new members, which absorbs a lot of resources. So far ip has not managed to include the many other logistics workers in the region in the organising effort, especially as many former Amazon workers who were part of ip have switched jobs and found other employment in the region—a good chance to get involved in workers’ struggles there as well. The organising experiences at Amazon Poland also show the limits of ‘official’ or ‘formal’ union activity, meaning the limits imposed by labour laws and the ‘representative’ form of a union, for instance during collective bargaining processes and strike ballots. The Amazon section of ip has organised a number of less formal activities, often with the help of supporters, such as rallies, and it has got involved in activity organised autonomously, such as debates on social media where workers share experiences with others, and spread information to the press. And of course, workers have become active themselves outside the legal framework, as during the slowdowns and other acts of defiance at work. Solidarity has been organised to connect permanent workers and temporary agency workers at Amazon, and in some cases workers from other sectors organised in ip supported the Amazon section, for example theatre workers from Poznań who demanded that their theatre stop sponsorship relations with Amazon, referring to the latter’s work practices. Meanwhile, a particularly annoying conflict was provoked by the mainstream Polish union Solidarność, which has far more members in general in Poland but a weaker stance in Amazon warehouses. While ip has its strongest presence in the Poznań warehouse, Solidarność is mainly present in the warehouses close to Wrocław, but has not managed to organise as many workers as ip. Solidarność tries to sell itself to Amazon as a collaborative and ‘reasonable’ union, while publicly attacking ip for being too ‘radical’ and irresponsible. Besides its union activity, Solidarność focuses on culturally conservative and religious issues, and actively supports the current right-wing Polish government run by the party PiS. Workers’ struggles at Amazon need to be coordinated beyond one country if they are to be efficient. Amazon warehouses in Europe are part of one distribution network, and—as warehouses in different regions store the same items—orders can be shifted from one warehouse to another if problems arise, such as bad weather, traffic jams or worker protests. Five such cross-border Amazon workers’ meetings have taken place so far in Poland, Germany, and France, and more are planned. The meetings are organised ‘beyond’ union memberships and hierarchies. In other words, all Amazon workers and supporters are welcome, as the goal is to build workers’ power and solidarity beyond the competition of union organisations. Only a few dozen workers have so far actively attended, but the cross-border meetings proved valuable for exchanging information on wages, bonuses, labour contracts, and labour court cases, and the information has been used in leaflets and statements, and found its way into workers’ discussions at the workplace and demands to local managements. The grassroots organising and ‘formal’ union activity at Amazon had some success, in maintaining a group of worker activists, the documentation of experiences of struggle, the continued involvement of new workers, and so on. Amazon’s dual employment strategy, its attacks on worker activists, the high rate of labour turnover, the obstacles presented by Polish labour laws, and the activists’ exhaustion as a result of the shift system are among the problems the union faces. ‘Informal forms of struggle have been tested, and might offer an alternative way to increase workers’ power at the workplace in the future. Rather than mere organisation-building, the confrontation with the company hierarchy in the warehouses and the collective experience of creating change through formal and informal means remain the main focus. The Amazon workers’ cross-border meetings are still at an embryonic stage. A core of worker activists are willing to take on the challenges in Poland, Germany, and France. They are driven by the fact that ‘cross-border’ organising helps workers involved to see the potential power of collective struggles as they learn that they are not isolated and others are willing to support them. They understand that it is vital to document and analyse workers’ experiences in different countries, and present them to new workers at Amazon and others in logistics companies elsewhere. However, the impact of the cross-border activity will remain limited unless more Amazon warehouse workers (and supporters) from more countries get involved. This article is also meant as a call to everyone working at Amazon or connected in some way to logistics workers’ struggles to get in contact and join in the organising. Choke Points: Logistics Workers Disrupting the Global Supply Chain is edited by Jake Alimahomed-Wilson and Immanuel Ness and is available from Pluto Press. This blog post is collectively authored by Amazon warehouse workers, in collaboration with activists from a grassroots union and the co-organisers of Amazon workers’ meetings.